A week after his eleventh birthday, Caleb Vincent vanishes with hardly a trace. After a three-year search, he is found living a seemingly normal life under a new name with a man he calls his father. While outwardly stunned with joy at his safe recovery, Caleb's parents and sister are privately scrambling to gather together the pieces of a shattered family. To escape the relentless media attention surrounding her son’s return, Caleb’s mother, Marlene, decides to flee the country and seek refuge in Costa Rica with Caleb and his younger sister, against her estranged husband's wishes. There Marlene forms a makeshift household with her husband’s expat mother and his charming, aimless older brother, all residing in a broken-down hotel perched at the blustery apex of the continental divide. In the clouds of their new home, the mystery of Caleb’s time gone unfolds while new dangers threaten to pull him back toward his former life. Where You Can Find Me, a darkly incandescent novel that progresses with page-turning suspense, is sure to establish award-winning author Sheri Joseph as a household name. "Joseph (Stray, 2007) turns the sensationalistic story of an abused boy who has seen the darkest parts of life into a transformative and often suspense-filled tale of identity and resilience. A deeply moving novel about a family determined to survive the greatest of tragedies." "A fraught subject, handled with gravitas and, improbably, grace." 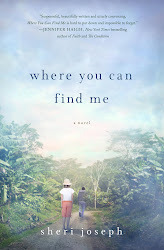 In Where You Can Find Me, Sheri Joseph has written an engrossing, deeply moving, and emotionally complex novel that has stayed with me every moment since I first read it, months ago. Joseph writes swift and faultless prose and miraculously real characters. This book spurs you to pay close attention to those around you and to love as fully in this life as you possibly can. "Where You Can Find Me is a tender, ticking bomb. Joseph's haunting novel of lost innocence and second chances is both terrifying and indelible, and will leave you clutching your family close." “In the mesmerizing and disturbing Where You Can Find Me, Sheri Joseph implicates the reader in a journey to the darkest corners of the soul as she explores the aftermath of horror for a teenage boy and his family. Yet all is not dark; the complex and vibrant characters find ample opportunity for surprising beauty. What happens in the present is as gripping as the mystery of the past, and Joseph creates a delicate balance of uncertainty and hope that carries us through to the piercing final pages." 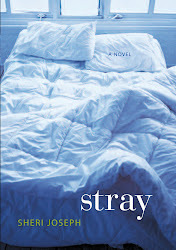 Winner of the Grub Street National Book Prize, Stray is a riveting psychological portrait of Kent, a young musician who is torn between his Mennonite wife, Maggie, and his ex-lover, Paul. When Kent and Paul rekindle their affair, Paul becomes obsessed with Kent’s marriage. And when he pushes too close, a tragedy binds these three characters uncomfortably and irrevocably together. Shifting between the wraparound porches and horse barns of rural Greene County and the seductive sidewalks of urban Athens, Sheri Joseph's remarkably assured debut explores the interior lives of two Georgia families soon to be linked by a marriage. This cycle of stories tackles dark themes -- a young daughter dying of AIDS, the menace of homophobia, the splintering of families, the discordant voice of religious fundamentalism -- but at its core it is a hopeful portrait of the different and often elusive faces of salvation. Summoning a diverse and provocative chorus of voices, Bear Me Safely Over offers up a kaleidoscopic vision of the common secrets and sorrows at the heart of a community that will have readers looking at all relationships with new eyes. I'm thrilled to announce that the new novel, WHERE YOU CAN FIND ME, will be published in 2013 by Thomas Dunne Books/St. Martin's Press. The pub date, so they tell me, is April 19. The story concerns a child abduction and is set in the cloud forest of Costa Rica. The book is now in editing, headed toward page proofs, and the designers are coming up with some interesting images for the cover. So exciting! I'll post the cover when there's a definite one. 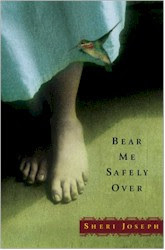 Sheri Joseph is the author of the novels Where You Can Find Me (Thomas Dunne Books 2013) and Stray (MacAdam/Cage 2007), as well as a cycle of stories, Bear Me Safely Over (Grove/Atlantic 2002). She has received a National Endowment for the Arts fellowship and the Grub Street National Book Prize, among other awards. She lives in Atlanta and teaches in the creative writing program of Georgia State University. Creative Loafing's "20 People to Watch in 2103"
Vanity Fair: "Belles, Books, and Candor"
April 16, 7:15 p.m.: Book launch for WHERE YOU CAN FIND ME: a conversation between the author and Susan Rebecca White, Georgia Center for the Book, Decatur Library, Decatur, GA.
May 4 and 5: Muse and the Marketplace, Boston, MA. May 15: Charis Books, reading and craft talk, Atlanta, GA.
May 22, 7:00 p.m.: The Book Cellar, reading with Ru Freeman, Rob Roberge, and Therese Svoboda, Chicago, IL. June 14, between 9:00 and 10:00 a.m., interview on WREG.TV's "Live @ 9" in Memphis, TN. June 15, 2:00 p.m.: The Booksellers at Laurelwood, Memphis, TN. June 18, 5:00 p.m.: Lemuria Books, Jackson, MS.
August 31, 3:00 p.m.: "Women on the Verge of a Breakdown/ Breakthrough," a reading and panel discussion with Susanna Daniel, Decatur Book Festival, Decatur, GA.
October 16, 7 p.m.: Agnes Scott Visiting Writers' Series reading, Agnes Scott College, Decatur, GA.
Where You Can Find Me--SIGNED!